I have ten minutes . . .
. . . while I wait for dinner at the fast food joint. I’m posting from my phone, so this will be short. The time line for the Mr. Gunn & Dr. Bohemia sequel is coming along. I expect to have the first pass done tomorrow. Now, I know I said I’d quit playing World of Warcraft a long time back. Well, I couldn’t resist—I bought the latest expansion pack the other day, and started playing last night. Not playing when I should be writing takes self-discipline but so far hasn’t been an issue. Right, food should be ready in a minute or two. Posting. 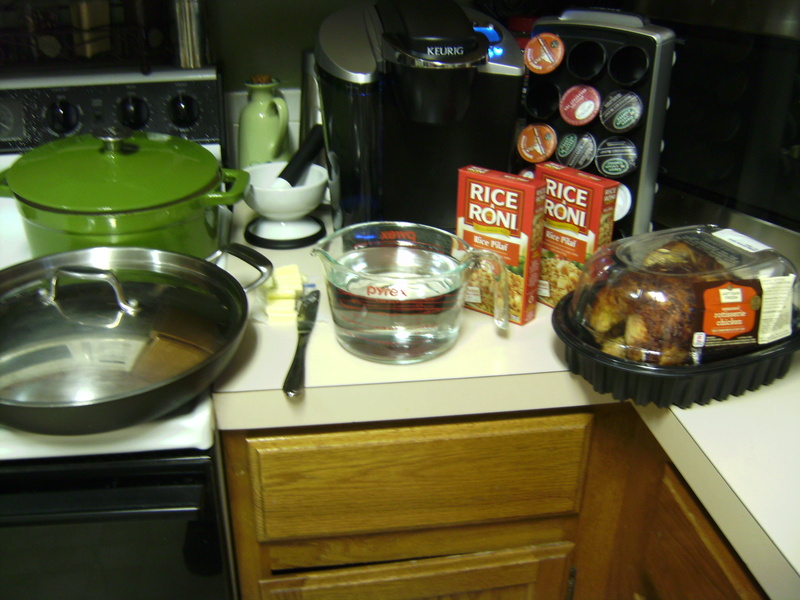 This is a simple recipe that we do fairly frequently; it uses packet rice and a ready-cooked chicken from the store to save time. It takes about an hour and a quarter, costs less than $10, and serves four, maybe more. 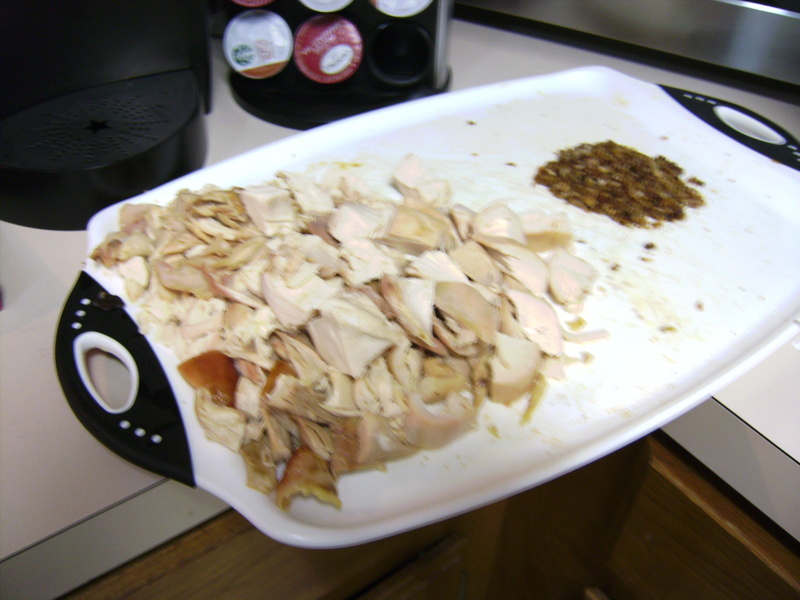 One ready-done seasoned roasted chicken (we get ours from Sam’s Club—we find they have the best seasonings). 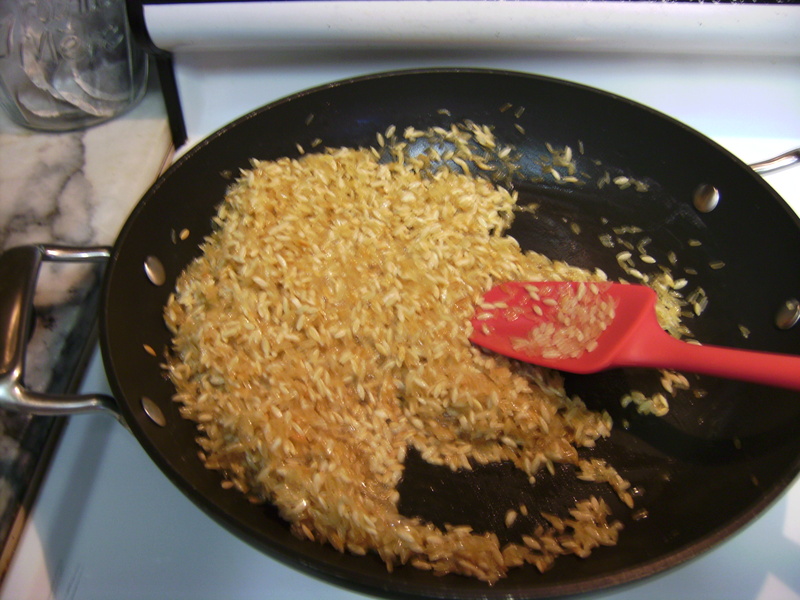 Melt the butter in the skillet on medium-high heat, then dump in both packs of rice. Keep it turning until it browns. You’ll hear snapping noises when it’s getting close to done. Carefully (because of scalding steam) add the water a little at a time, stirring continuously. Turn up to high heat. Add the contents of the seasoning packets, stir in. When the mix starts boiling, turn the heat all the way down (you’re aiming for a really gentle simmer), and put the lid on. Set your timer for about an hour. There may be broth in the bottom of the container the chicken comes in; if so, drain it into something and put it to one side. Get the skin off; keep the crispy bits with the seasonings (the parts from the top of the breast and legs, probably) and put them to one side. Separate all the meat, discard the bones and fatty parts. Cut the meat into bite-sized chunks, about ¾”. Scrape any fatty junk off the seasoned skin, and chop the skin finely (it’s the seasonings you’re after here, so an alternative is to scrape those off the skin. Whichever’s easiest, and you don’t need much). Cut up chicken on the left, finely chopped seasoned skin on the right. Brown bits of chicken are from the drumsticks, if you’re wondering. 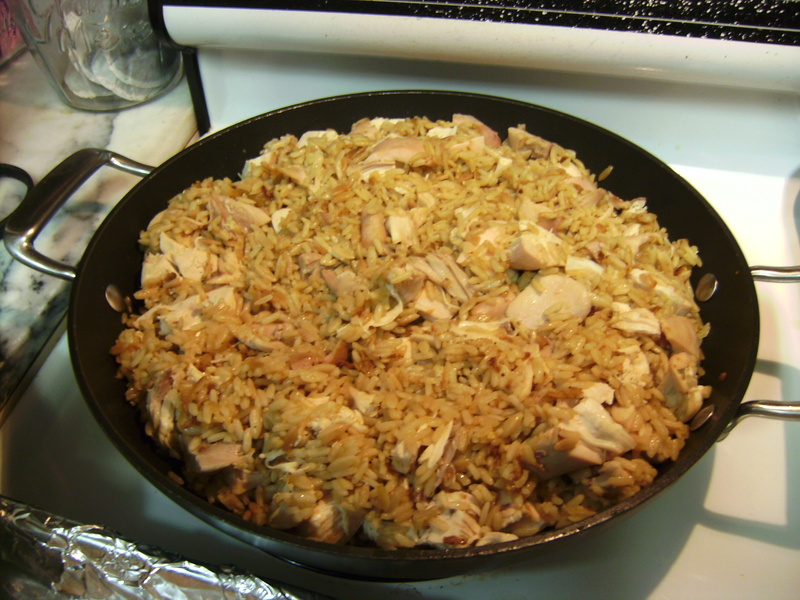 If you had some broth from the chicken, add that to the rice. Add the chopped skin/seasonings, stir well. Add the chicken, stir it all in. Put the lid back on and let it stay on a low heat for maybe ten or fifteen minutes, stirring it around once or twice. This is just to get the chicken nice and hot; you might want to turn the heat up just a little, but not so high that it burns. You’re done! Serve with nice bread (garlic bread, maybe, or seasoned bread sticks).